Holiday time!!! Jason and I are really excited to be heading west for our 2 weeks of holidays. September is a perfect time for camping with fewer bugs and even fewer people! It is my favorite time to camp and the weather is crisp and enjoyable. I may retract this statement if we are in a foot of snow in the mountains! We got up at our usual work day time and finished the final touches on packing. We stopped for a top up on gas at North Battleford and continued onto Lloyd. Just before arriving at Lloyd Jason said “Did we bring pillows?” Of course I said “NO”! This pillows have been the most forgotten thing on our camping trips so thanks to Lloyd’s Walmart we now have permanent trailer pillows!! I was super disappointed that the Saskatoon Co-op didn’t have any corn on the cob, but I was able to get some Taber corn in Lloyd from a friendly roadside vendor, a great benefit to our unexpected stop. 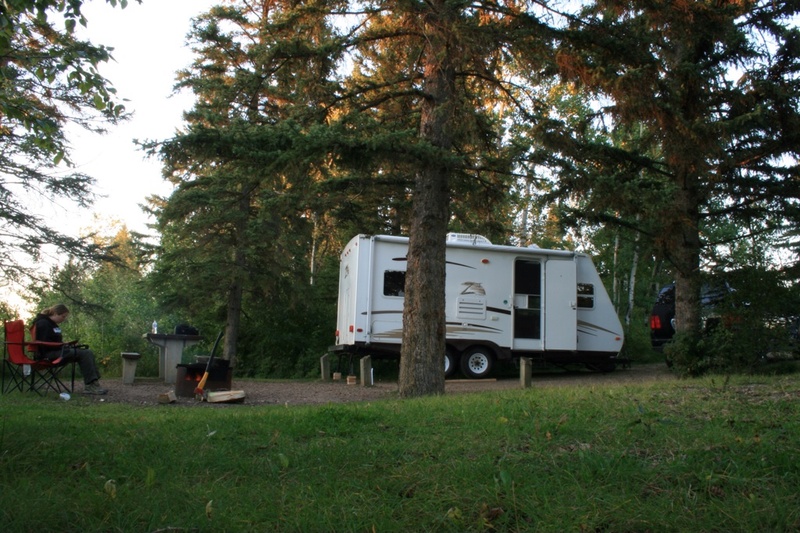 Within a few long hours we were at Elk Island National Park. We have never been here before so we were both super excited to see it. We grabbed a park map at the information center and off we went. It is just shy of 20 km from the park entrance to the camping spots. The entire national park is fenced and has cow gates on the roads to keep their prime attractions in the park. Unfortunately we didn’t get to see any animals on our way to our campsite. After we got set up at our awesome reserved campsite we were off exploring. 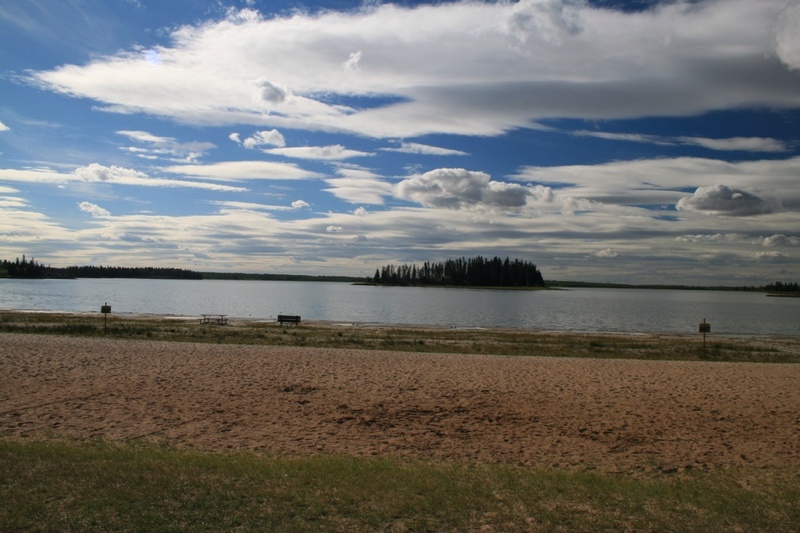 We went and sat down by the Elk Island beach for a while. Not too much of a beach and beware of the itch (it says so, on the posted sign)! We decided to go back down the road for to get a glimpse of the bison. We didn’t have to go far and we were met by a huge male. He was crossing the road and came really close to the truck. He seems really domesticated and didn’t care that we were there. That was definitely then closest that I have ever been to a bison before, including the many bison of the Yukon! 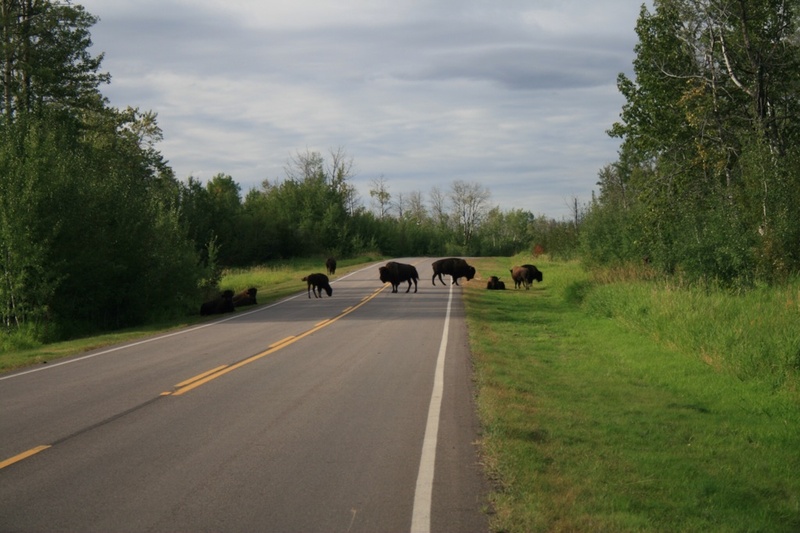 Our trip to the road called Bison Loop was very productive as we must have saw about 25-30 bison on the road!! We saw lots of little baby bison which was really neat. 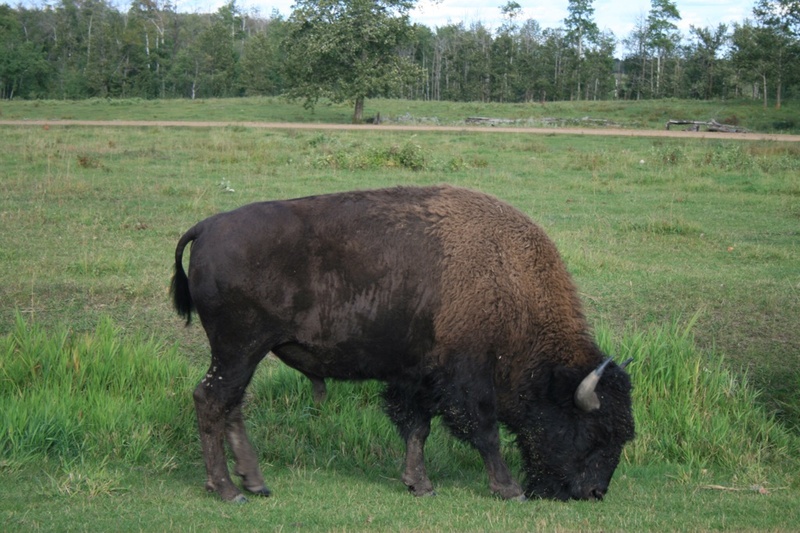 According to the pamphlet there are about 145 bison in the park. We haven’t seen any elk, so the name has not lived up to this point. We returned to our campsite for a delicious steak supper cooked over the wood fire and of course Taber corn. This spot is really great and I can understand why our Edmonton neighbors like coming out here. What a treat to have such an awesome national park only a half hour away! It is a beautiful night with no misquotes!! !